Josh Blaylock is a comic book writer and artist based in Chicago, IL. With nealry 100 comic books published to date, Mercy Sparx is his most recent series. 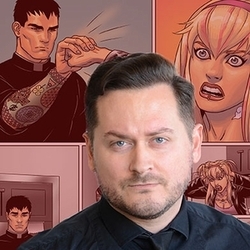 He is the leading force behind Devil's Due Entertainment, the publisher of several creator-owned comic book titles including Plume, Squarriors, Tales of Mr. Rhee, Solitary, and Blaylock's own Mercy Sparx. Blaylock specializes in a comprehensive approach to publishing that embraces both traditional store distribution with modern crowd funding and digital technologies to elevate his collective creator network together.